Collector Artist Network: Phase I is the first phase of an ongoing data collecting and mapping research project on the “nature” of the society of art. 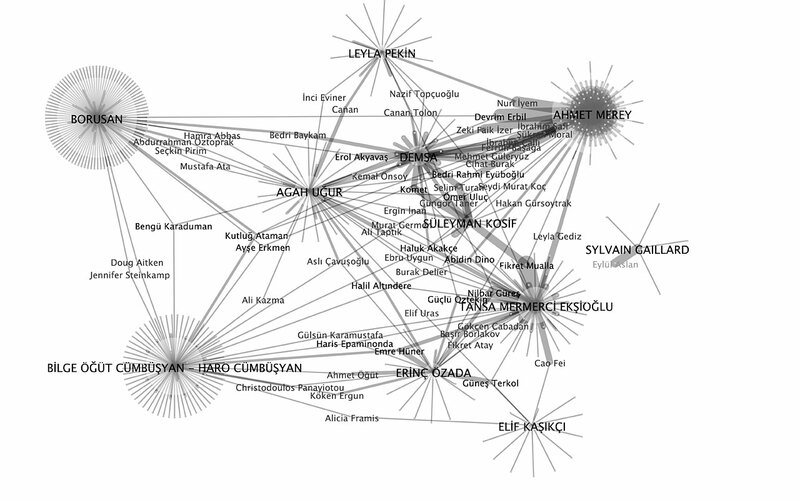 Each collector in the map was asked to contribute a list of artists in their art collection; these lists of shared artists connect the collectors on the diagram, which organizes itself by running as a software simulation. The names of the artists and collectors naturally find their position on the screen through connecting forces, revealing the central actors, indirect links, and tight clusters. As more data is collected, the piece will continue to evolve, showing in greater depth the relationships held between artists and collectors as well as between artists and collectors respectively. Collector Artist Network: Phase I is presented as an interactive projection on a multitouch wall screen, allowing the viewer to further navigate the network and explore relationships more in depth.